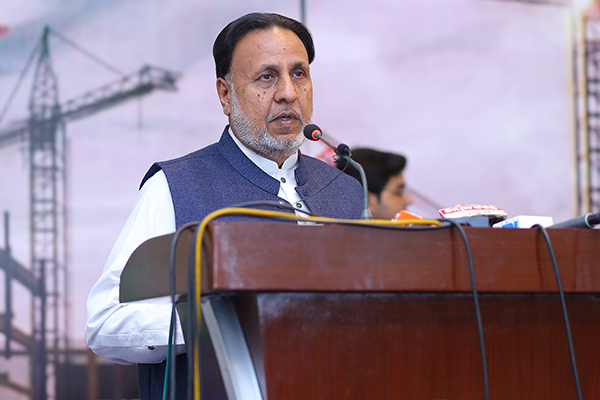 Mian Mehmood ur Rashid, Provincial Minister of Punjab for Housing, Urban Development and Public Health Engineering, thanked UMT for inviting him to become a part of such an innovative conference and exhibition. He stated that Building and Construction, Home Appliances, and Renewable Energy are the most important focus areas for the masses of Pakistan. However, housing and construction is one of the biggest issues in our country. It is very unfortunate that our previous government had failed to plan any viable housing projects. The Minister mentioned that Pakistan has large piece of state lands which can be utilized for housing schemes for the masses. The government is planning to establish New Pakistan Housing Authority in major cities of every province. He said that we are trying our best to speed up this project by implementing one window operation. He also shared that the government will not be involved in the construction process but definitely will work as a moderator, regulator and facilitator. He quoted that loan for houses will be allotted in three categories; first ‘poorest of the poor’ who cannot afford homes; secondly, those who own small tracts of agricultural lands but don’t have enough financial support to build their houses; and third are lower to middle income category people. He added that development authorities were originally mandated to facilitate private developers but had failed to do so in successive governments. This destroyed the whole infrastructure. However, the present government has vowed to facilitate private developers to the fullest. In the end, he paid tribute to his dearest friend, Late Dr Hasan Sohaib Murad who was always hard working, creative, and willing to accept challenges. He said that he still remembered when he started the Institute of Leadership and Management on a small platform but he had the vision and achieved what he dreamt.